How good could a movie be if five different men received at least partial credit as directors – and nineteen writers contributed to the screenplay? And, what if the most evil and imposing character in the movie was a five-foot tall former kindergarten teacher; and her nemesis, the symbol of goodness, was fifty-four years old? What would you call foolishness like that? Well, you could call it a classic because those are some of the true facts behind the original ‘Wizard of Oz’ – and now, seventy-four years later, this is its prequel, the story of how the wizard got to Oz in the first place. 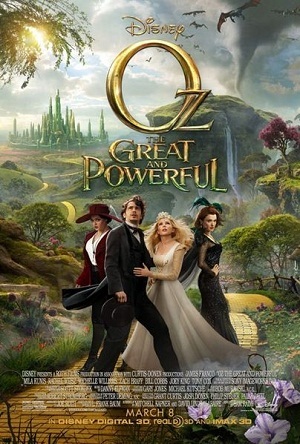 This is the story of a small-time con-man and philanderer, Oscar Diggs (James Franco) who takes off from Kansas in a hot air balloon, is caught up in a tornado (of course), and ends up in Oz. There, he gets an education in witches, and despite being a having no real magical powers, he works with others to save the kingdom. There is a good lesson here – “Goodness is better than greatness” — a bit of humor (courtesy mostly of the monkey) and some emotional moments with the wonderful China Doll. It’s not bad; I’m just not sure it was worth waiting all this time for. I wish it had more of a sense of fantasy and innocence, more characters I could fall in love with, and at least one song that stuck in my heart.